(New York: Bounty Books, 1976), 112 pp. I don't know anything about Rose London. I assume she is a British author of popular works and not a university professor or scholar. Her book, Zombie: The Living Dead, is a popular, pictorial history of the undead in movies. It covers not only American movies but also those from Great Britain, Mexico, Canada, and other countries. The book was originally published in Britain. 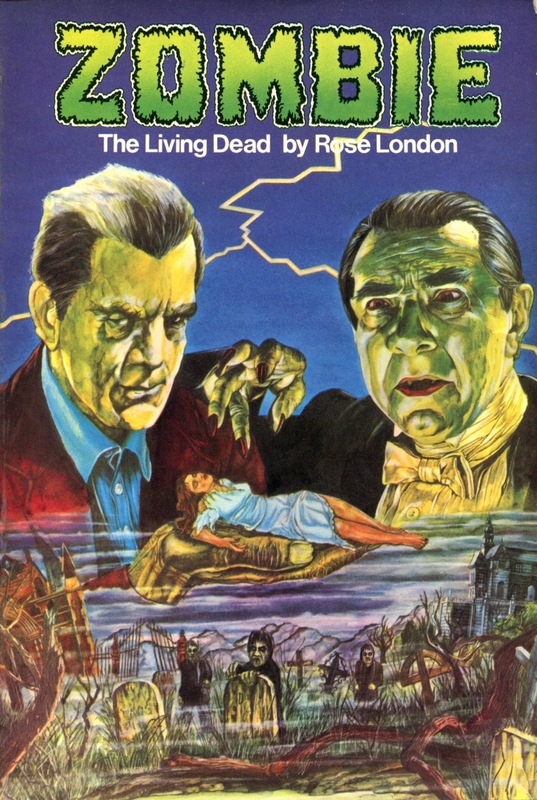 It's worth noting that, although Ms. London's book covers vampires, mummies, and other undead creatures, it is entitled Zombie: The Living Dead. That indicates to me that zombies were gaining traction in the mid-1970s as a leading monster type. Nevertheless, the author's discussion of zombies doesn't begin until page 76, and about half of that discussion is devoted to science fictional themes, including invasions by aliens bent on controlling the minds and lives of people on Earth. There is, without a doubt, a connection between movies like Invasion of the Body Snatchers and stories of zombies, but I'm not sure that stories of alien invasion belong with stories of zombies in a book like this one. The zombie section of Zombies: The Living Dead includes a few movies worth mentioning in any history of zombies. One is Revenge of the Zombies (1943), in which "[a] doctor operating in the swamplands of the Deep South tried to create an army of invincible zombies to help the Nazis." (p. 82) Thus, even early on in the history of zombies in America, storytellers recognized the significance of zombies as representative of mass movements, especially political mass movements. Another is Invisible Invaders (1959), an alien invasion movie in which the dead rise from the grave en masse. Thus, as early as the 1950s, there were scientific undead vs. the supernatural undead. And they moved in masses. Still another is Plague of Zombies, a Hammer film from 1966 in which a strange plague kills off the inhabitants of an English town, only for them to come back as zombies. Although there is a scientific explanation for the zombie-ism in the movie, there is also a supernatural explanation in that the man responsible for the plague has been to Haiti and has learned about voodoo there. Having never seen Plague of Zombies, I can't say how those two things are reconciled. In any case, Plague of Zombies seems to have anticipated Night of the Living Dead and all subsequent stories of zombie hordes infected with disease. So it looks like the zombie in film evolved over the years from a harmless and helpless slave--a walking deadman lacking any will of his own--into a frightening and dangerous monster. That is to be expected, as there aren't very many dramatic possibilities represented by a figure who lives, yet lacks all human personality and attributes, motivation or agency. There was also an evolution from the zombie made by magic to one made by science. And there was of course an evolution from solitary zombie slaves or small groups of slaves to out-of-control hordes or masses. I wonder if there will ever again be a zombie movie based on the original idea of the zombie as one of the harmless (and pitiable) undead. I have a feeling that moviegoers, having forgotten the slave origins of zombies, would complain, "That's not a zombie." That's how far we have come, I think. It seems obvious to me, though, that there was not a first of anything when it comes to zombies in film other than that there was a first zombie movie, which was, of course, White Zombie, from 1932. Instead, there was an evolution of zombies. I'll have more to write on that in an entry I will call "The Island Theory of Zombiation." (New York: The Macmillan Company, 1966), 309 pp. 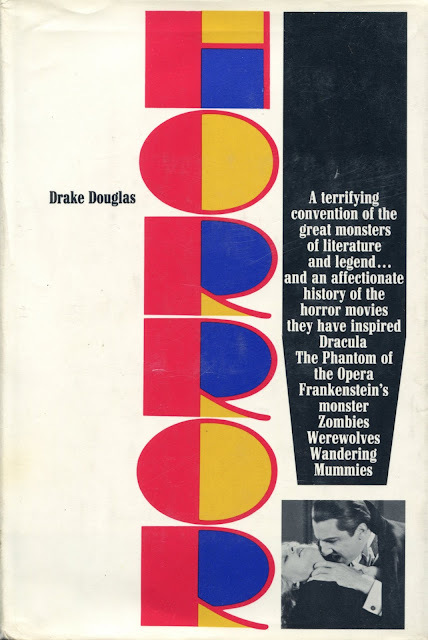 Drake Douglas is the pseudonym of a gentleman who has been deeply involved with horror throughout his life--and prefers to remain anonymous. Maybe that's why zombies are on the same curve as robots (and human beings) in the graph illustrating the uncanny valley, about which I wrote not long ago. Mr. Zimmerman also indicts "[t]he white man" for his support of zombie-ism. Again, the critical theorist might see here an indictment of capitalism, or, at the very least, evidence of his idée fixe, the historical "class struggle," but that would be a misreading of the facts, I think. Although Mr. Zimmerman doesn't mention Haiti in this passage, zombie-ism seems to have been limited to that island nation. If there were white plantation owners and black slaves, then the discussion is of colonial times, that is, Haiti before it attained its independence in 1803. That leaves two possible groups of white plantation owners: 1) Those living under the French crown, a feudal, statist, and essentially non-capitalist or anti-capitalist regime; or 2) Those living under the governments that followed the overthrow of the monarchy, which were leftist rather than monarchist or reactionary but were nonetheless statist. By extension, then, the fear of becoming a zombie and of being held as a zombie-slave is a fear of enslavement under either a feudal and statist regime or a leftist and statist regime. Where in this is the capitalist? Disregarding all of that, the fear of zombie-ism has passed from a fear among black people of being made into zombies and being held in slavery as zombie-slaves--the zombie himself is passive and harmless in this case--to a fear among all of us of being attacked and killed by zombies that are extremely aggressive and dangerous. For white people without a history of being held as slaves, there is no fear of being returned to slavery without end. Second, the fear of zombie-ism has passed from the realm of the supernatural--which no modern person fears anymore--into the realm of the scientific, which every modern person respects. Third, the fear of zombie-ism has gone from one as on a small scale in a distant and obscure part of the world to one as on a mass scale in one's own modern and advanced society. It is, in short, a fear of hordes of scientific zombies arriving at your door. Although he described the zombie in 1966 as "a fairly new arrival to the world of monsters" and one "not surrounded by the wealth of legend which has built itself around the more widely known monsters," Werner Zimmerman seems to have predicted something more for this representative of the walking dead. The zombie is, he wrote, "a frightening powerhouse as capable as the vampire of striking fear into the hearts of those who come across him." (p. 194) You could argue that the zombie has actually replaced the vampire in that role. 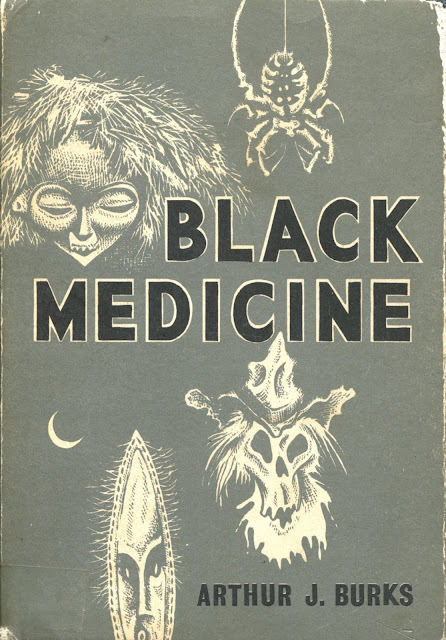 Black Medicine by Arthur J. Burks was published in 1966 by Arkham House of Sauk City, Wisconsin, in an edition of 2,000 copies. Arkham House books are typically rare, costly, and prized by readers and fans of weird fiction. I was lucky enough to find recently a reasonably priced copy of Black Medicine. I finished reading it on March 11, 2017, and can report on its contents. I had hoped to find zombies in the stories of Arthur J. Burks. I'll cut to the chase and let you know there aren't any. Burks was born in Washington State and served in the U.S. Marine Corps during World War I. He also served in occupied Hispaniola or Santo Domingo, probably in both Haiti and the Dominican Republic. Burks served in other places as well, possibly in the Pacific. These locales show up in the stories in Black Medicine, of which there are eleven. The first, "Strange Tales of Santo Domingo," is actually in six parts, so it might be more accurate to say there are sixteen stories in the book. The sixteen stories in Black Medicine fall into three groups, plus one story that stands alone. One group of stories is set in the Dominican Republic. They include "Strange Tales of Santo Domingo" in its six parts and "Three Coffins." Another group is set in neighboring Haiti. These include "Voodoo," "Luisma's Return," "Thus Spake the Prophetess," and "Black Medicine." The third is a looser group of unrelated stories set in different places: a time-travel fantasy called "When the Graves Were Opened"; a dream-fantasy called "Vale of the Corbies"; an oceangoing ghost story, "Bells of Oceana"; and a ghost story set in Burks' own Washington State, "The Ghosts of Steamboat Coulee." I consider "Guatemozin the Visitant" to stand alone for different reasons, first because of its length (72 pages in Black Medicine, or of novelette length); second, because it's the only story in the book not to have appeared in Weird Tales; third, for its setting in Mexico; and fourth for its unusual themes and unusual power. One very appealing characteristic of Burks' writing is its even-toned and effortless authenticity. As a military man serving on board ship and in exotic locales, he had a rare familiarity with his subjects and settings. He didn't have to do research on what his characters do and where they live and work, for he did those things and lived and worked in those places himself. It's refreshing to read genre fiction of such authenticity and verisimilitude. Burks was given to pulpish and purplish prose at times, but those aspects of his writing are easily outweighed, I think, by his skill at describing real places and real situations. Arthur J. Burks was one of the first authors--if not the first--to have a story on Voodoo in Weird Tales. His first two stories in "The Unique Magazine," published under the pseudonym Estil Critchie, were "Thus Spake the Prophetess," from November 1924, and "Voodoo," from December 1924. "Thus Spake the Prophetess" is set in Haiti, but there is no explicit mention of Voodoo or any of its practices, figures, or spirits. "Voodoo" is of course a different story (no pun intended). It, too, is set in Haiti and involves the search for a Voodoo priest by an American serviceman. The serviceman, Rodney Davis, infiltrates a Voodoo ceremony, where he sees a Maman Loi, "the priestess of the serpent," a Papa Loi, her male counterpart, and the sacrifice of a "goat without horns," that is, a human being, in this case an adolescent girl. Davis returns to his commanding officer to report, laconically, that justice has been served. 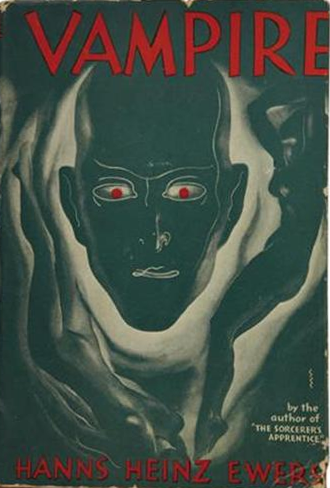 Other tales of Voodoo followed, the longest and most detailed of which is "Black Medicine," the title story of this collection and the cover story for the August 1925 issue of Weird Tales. I had speculated before that the larger figure in that cover illustration might be a zombie. As it turns out, he isn't, for there are no zombies in Black Medicine. As it turns out, the figure is a man, Chal David, "chief Papa Loi of Bois Tombé." The woman in front of him is a Maman Loi, "high priestess of the cult of voodoo." In the background of the cover illustration are the "followers of the Great Green Serpent." If I understand Voodoo (also called Vaudoux and Voudon) correctly, the "Great Green Serpent" of Haiti might also be "Li Grand Zombi" of Louisiana. Nevertheless, zombies appear to be absent from the fiction of Arthur J. Burks, leaving William B. Seabrook as still the father of zombies in America. One more thing: There are many good and enjoyable stories in Black Medicine, but one of my favorites and one of the most powerful, I think, is "Guatemozin the Visitant," a story of a revenant from the Aztec past who, when his burial place is disturbed, comes back to wreak a terrible vengeance on the Mexico City of 1931. I am reminded of The Plague by Albert Camus, a far more significant work to be sure, but I would not take anything away from Burks except for, again, his occasional pulpish and purplish prose. (Sauk City, WI: Arkham House, 1966), 308 pp. "Strange Tales of Santo Domingo"
Black Medicine by Arthur J. Burks (1966), with cover art by Lee Brown Coye. "Salt Is Not for Slaves" was one of the first zombie stories, written by the scenarist of White Zombie, a movie not yet released when the story was published. This is one of my favorite stories in Tales of the Walking Dead. It pushes the origin of zombies back to the Haitian Revolution and makes the strongest association of any story here between slavery under French colonialists and zombies. I don't think anyone can say whether that association is accurate or not, as the origins of the zombie in Haiti appear to be lost. In any case, Weston's story is set in the 1920s or '30s in Haiti, but it is mostly about the historical past. It is a tale of zombie-slaves who don't know they're zombies until they taste salt. With that, they return to their graves. It's interesting that in "Salt Is Not for Slaves," the zombies speak and live like normal human beings. Also, the (presumably) white narrator simply reports on his experience and recounts what he hears from the old Haitian woman. Other than receiving a bad scare, he is never under threat. You could pretty well count on August Derleth's being on top of developments in weird fiction. His story "The House in the Magnolias" was published before White Zombie was released. It must have been one of the first zombie stories in America, and it incorporates elements of the Haitian zombie story, including the eating of salt. It is set, however, in Louisiana, home of a different kind of zombi(e), the Voodoo serpent god, Li Grand Zombi. In other words, Derleth transferred the Haitian zombie to the American mainland, a key development in the history of zombies in America. The narrator is an artist in the household of a woman named Rosamunda Marsina and her unseen Haitian aunt. Also in the household and in the fields around the house are the walking dead. The threat is from the unseen Aunt Abby, who turns out to be a zombie-master. The people threatened--the narrator and his now lover, Miss Marsina--are white (or she is a very light-skinned mulatta). Vivian Meik saw the movie White Zombie and liked the title. He recycled that title for his story of 1933. "White Zombie" is set in Africa, but there is a connection to Haiti: a missionary claims to have seen a strange mist only in those two places, a mist that haunts and menaces the protagonist. As it turns out, the mist is associated with Voodoo and with zombies under the control of a white woman who has essentially gone native. (The association of mists with Voodoo and zombi(e)s is a continuing theme in fiction.) In short, the zombie-master is a white woman who threatens white people. The black zombies themselves are far less of a threat. "The Hollow Man" is a story of the walking dead, though not explicitly of a zombie. The undead man is white, but he has been made by black men--the Leopard Men--in Africa to be used as their slave. Remembering the man who murdered him, the undead man escapes from slavery and sets off to find that man. His quest takes him all the way to England. There is a variation here: the Leopard Men take the place of the zombie-maker, but their victim is white. He in turn torments the man who murdered him, who is also white. In short, "The Hollow Man" doesn't quite follow the conventions of the zombie story, but then it isn't explicitly a zombie story. "American Zombie" is a brief tale inside of a tale. It is told to a journalist by a M. Champney, a Frenchman who has traveled to America and tells of seeing the creature of the title. She is a white woman who lies on a bed behind a locked door in a building on Lennox Avenue in Harlem. She is one of the living dead, made by Voodoo magic and subject to the commands of her master. She is referred to as a guède, a zombie, but also the French word for the plant woad. In Voodoo, the Guédé, also spelled Gede or Ghede, are the loa, or spirits, of the dead, specifically the loa of sexuality, fertility, debauchery, and so on. To continue, in "American Zombie," the zombie as one of the walking dead is associated with the conventions of Voodooism. Though brief, Dr. Burley's story is rich with zombie lore. It even mentions The Magic Island by William B. Seabrook. In "American Zombie" the white victim is a zombie, while the zombie master is black. Like "The House in the Magnolias," Thorp McCluskey's story for Weird Tales is set in the American Southland. The protagonist is a Northerner who has gone looking for his girlfriend, who is a resident of a plantation house owned by her great-uncle. Sharing the house is a monstrous white minister, a Rev. Warren Barnes. As it turns out, Rev. Barnes is a Voodoo master, a manipulator of Voodoo dolls, and a maker and master of zombies. He has learned his craft from a black Voodoo-man. Upon Barnes' death the zombies return to their graves, and the way is clear for the protagonist and his girlfriend to be together again. Here, then, is another variation, for the zombie-maker and zombie-master is white, as are the objects of his torment. The story--cruel and less than likable--has a weird-menace atmosphere fitting for its time. "I Walked with a Zombie" was written by Cleveland journalist Inez Wallace for The American Weekly, the Sunday magazine of the Hearst chain of newspapers. It's similar to "Dead Men Working in the Cane Fields" by William B. Seabrook and includes most of the conventions of the zombie story, including the eating of salt. There are three short accounts of zombie-ism in Inez Wallace's article. The first is of a white woman who is made into a zombie by a black Haitian woman and is returned to her grave by the white woman's husband. The second is of a group of zombie-slaves held by a black headman named Ti Michel and of the revenge upon that man taken by the still-living. The third is of a black woman in Port-au-Prince who has zombie-slaves dance for her and whom she manipulates with mud figures like Voodoo dolls. (See "Ballet Nègre" below.) By the way, the 1942 film I Walked with a Zombie was inspired by and named after Inez Wallace's article. "The Zombie of Alto Parana" is not at all a zombie story. The word appears only in the title. I assume it to refer to one of the two main characters in the story, both of whom live on the edge of the world in a backwater jungle of Argentina. One of the two, the German Emil, evidently cannot return to the outside world. His life is like a death-in-life, and that leads me to think he is the zombie of the title. The other, a British man named Clift, is in a kind of exile, too, but he can return and means to return home. Emil has other ideas for him. This is perhaps the most psychologically complex and character-driven of all the stories in Stories of the Walking Dead. It belongs here, I think, only by a stretching of the definition of "the walking dead." "Ballet Nègre" is the most recently published story in this collection. Like "The Hollow Man," it is set in England. The zombie-master is a black Haitian who runs a dance troupe. The zombies are also black. The victim is a white reporter investigating the dance troupe. Before dying, he manages to feed the zombies some meat. The story ends with an image of them making their way westward across the English countryside, in the direction of their Haitian graves. So in the conventional zombie story, there are three (or four) main figures: 1) The zombie-maker/zombie-master; 2) The zombies he or she has created; and 3) The tormented, sometimes a man, sometimes a woman, sometimes a couple. Any or all of these figures can be white. It doesn't seem to matter much whether the zombie-maker/zombie-master--the tormenter--is white or black. The zombies of course are among his or her victims--they are obviously among the tormented--but if they are black, they are also depersonalized to a large extent. They are merely bit players in the zombie drama (as seems to be the case in the contemporary zombie story such as The Walking Dead). It seems to be much more significant when a white person is made into a zombie. A white zombie is at the very least a tragedy. It may also be an affront or threat against white people. Here's the kicker, though: it seems in almost every case in the conventional zombie story that the tormented person or persons is white. That may have been the only way that the zombie story could make its way into the white culture of the 1920s through the 1950s or '60s, for a black hero, a black heroine, or the two together would not have appeared in movies, short stories, or novels made or written for white people. (1) That makes me think: There was black cinema in those days--was there ever a black zombie movie? Or was Ben, the black man in Night of the Living Dead (1968), the first black hero in a zombie story? And look what happened to him. Was he killed because he represented an implicit threat to white people, especially in the era of black marches and civil rights? According to Wikipedia, that fount of all knowledge, Duane Jones was cast in the movie because he had the best audition of all the actors considered for the part. So if the screenplay was already pretty well written by the time George Romero was holding auditions, then the hero--even if he had been white--was fated to be shot. That would not have been a racially charged episode in the movie. But because the part was played by a black man, I can't help but see a racial element, however subtle it might be, especially with the sounds of police radios and barking police dogs as the backdrop for the final sequence. A final note: There are no zombie apocalypse stories in Stories of the Walking Dead. I wonder now what was the first such story in print. (1) The exception to all of this is "Salt Is Not for Slaves," in which the main actors in a story told by a white man are in fact black. 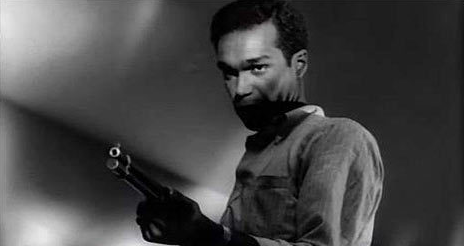 Duane Jones (1937-1988) in Night of the Living Dead. Was he the first black hero in a zombie story? "The Country of the Comers-Back" was originally a part of Lafcadio Hearn's series of travelogues on the West Indies, written for Harper's New Monthly Magazine and published in 1888-1890. This series was collected and reprinted in Two Years in the French West Indies in 1890 and reprinted again in later years. In that book, Hearn's story was called "La Guiablesse." Peter Haining changed the title to the more evocative (and pertinent) "The Country of the Comers-Back." We should note that Martinique, on which the story is set, is called "the Island of Revenants" or "the Island of the Comers-Back" because people who visit there are supposed to find it so pleasant that they want to return. Although Martinique is also called "the Island of Ghosts," the sobriquet used as the title here has nothing to do with zombies, as when Hearn's story was written, zombis were still spirits and not the undead that we know today. There are actually two stories in "The Country of the Comers-Back." The first is Hearn's investigation into the meaning of zombi. He asks Adou, the daughter of his landlady, What is a zombi? (Not the first nor the last time that question is asked in the annals of zombiedom. I'm still not sure we have gotten the picture.) Her answers are vague. A zombi is something that makes disorder in the night . . . zombis are everywhere . . . a zombi is a woman fourteen feet high who comes into your locked house at night . . . it is a five-foot tall dog that also comes into your house at night . . . a great fire on the road at night, one that continually recedes as you approach: that is made by a zombi . . . "a horse with only three legs that passes you: that is a zombi." One thing Adou makes clear: a zombi is not "the spectre of a dead person" or "one who comes back." The second story in "The Country of the Comers-Back" is of a Guiablesse, or devil-woman, who lures a man to his death. My friend points out the similarity of the word to diablesse, a female devil. In Caribbean folklore, there is another devil-woman called La Diablesse, probably the same kind of creature. "Jumbee" was written and published before the advent of the Seabrook zombie. It is set in the Virgin Islands and is a tale told by a native to a visitor from the mainland United States. The visitor, Mr. Lee, has read about Martinique and Guadeloupe and has encountered the word Zombi before. (He must have read the travelogues of Lafcadio Hearn, who is mentioned in the story.) He knows about Jumbees, too, for he has read The History of Stewart McCann (evidently a fictitious book, à la Ech-Pi-El). Like Zombis, Jumbees are spirits. Mr. Da Silva, the teller of the tale, describes the Jumbees he has seen: a boy, a girl, and a "shriveled old woman," three together, hanging in the air next to the road. "The Hanging Jumbees have no feet," Mr. Da Silva explains. "Their legs stop at the ankles. They have abnormally long, thin African legs. They are always black, you know. Their feet--if they have them--are always hidden in a kind of mist that lies along the ground . . . . they do not twirl about. But they do--always--face the oncomer . . . ." (First set of ellipses added.) (This description of floating and footlessness reminds me of the Flatwoods Monster and the Mothman.) The tale continues without any further mention of Zombis, for in Rev. Whitehead's tale, Jumbees have taken the place of Zombis as the spirits of the night. "Dead Men Working in the Cane Fields" is originally from William B. Seabrook's syndicated newspaper features of 1928. Like Lafcadio Hearn more than a generation before, Seabrook traveled to the Caribbean to report on local culture, folklore, etc. His articles were collected in The Magic Island, published in January 1929 to immediate acclaim and great success. It is because of Seabrook that we have zombies in America today. You might say that he carried the zombie virus from its isolated tropical fastness into our large, bustling country. After alternating periods of incubation, infection, remission, and reinfection, the virus is now among us and everyone has become infected. Like Hearn's article, "Dead Men Working in the Cane Fields" is actually two tales told to Seabrook and relayed to us through his writing. The first tale is the paradigm for zombie stories that came after it and that almost fill this anthology: men and women raised from their graves by a zombie-maker, held as slaves without mind or will, and returned to their graves only when they taste salt or eat meat. In short, they are the walking dead that we know now, except that they are not cannibalistic or threatening in any way. There is a statement in "Dead Men Working in the Cane Fields" that stands out for me. Lamercie, a black female overseer of zombie-slaves, tells Seabrook, "Z'affrai' neg pas z'affrai' blanc'." The affairs of blacks are not the affairs of whites. (1) Zombie-ism is a thing among black Haitians, she is saying. It is not something with which white people should concern themselves. I think that's an important thing to know for two reasons. First, among the zombies encountered in the story are several slaves under Ti Joseph, "an old black headman," who has them work for him at Hasco, the Haitian-American Sugar Company. Leftists might see this as an example of capitalist and imperialist exploitation of zombie-slaves. In actuality, the zombie-slaves are being exploited by a black headman, and it is his affair. Hasco simply employs the people who are presented to them by Ti Joseph, a kind of recruiter or subcontractor. Yes, Hasco is there in the island nation of Haiti and is either providing work or providing the opportunity for workers to be exploited, however you might look at it. But the culpability lies solely with Ti Joseph and similar native slave-masters and overseers. They are the ones who have made the zombie-slaves and/or are exploiting the zombie-slaves. Hasco had nothing to with with either action, for zombie-ism during the American occupation of Haiti was still "z'affrai' neg" and not "z'affrai blanc'." The distinction is an important one. Nevertheless, it may be lost on leftists in academia today, despite their vast erudition. Second, and more importantly, I think, zombie-ism was presumably practiced in Haiti for generations, if not centuries, before Americans arrived there in the 1910s. It was, again, an affair for black people, and no one outside the island seems to have known about it until William Seabrook sent out his dispatches to the American reading public. (2) Zombies became popular only after they were transferred from their originating black culture into the larger white culture. Remember, the first zombie movie was called White Zombie. Call it cultural appropriation if you like (3), but zombies came of interest to white people only after that transfer, and especially when zombies, zombie-makers, zombie-masters, and Voodoo in general were seen as threats to white people. For as long as zombies were "z'affrai' neg," there was no threat, at least to white people. We see the same thing today where black men are killed or black women go missing and almost nothing is said about it in the mainstream media. It seems to me that this is the story in general of black culture in its transfer to white culture. For example, when jazz, blues, and rock-and-roll were black forms, they were of little or no interest to white people. As they began being transferred into white culture, they were seen by many people as being negative (neg-ative?) or even threatening. Once they were pretty fully whitified--jazz in the 1920s (under Paul Whiteman, no less), rock-and-roll in the 1950s, and blues in the 1960s--they became less negative and more acceptable in the white mainstream. It reached a point where some black practitioners of these black forms were seen among white people as somehow threatening or hostile. Miles Davis comes to mind as an example. In any case, today, zombies are mostly white and are very popular among white people. White people in the real world see themselves as zombie-slaves or see other people as zombie-cannibals or zombie-deadmen. The black past of zombies seems to have been forgotten. The paradigm of the threat of zombie-ism--perhaps especially of black zombie-ism--to white people began after the publication of The Magic Island and continued for decades in popular fiction, as we'll see in part three of this series. The second tale in "Dead Men Working in the Cane Fields," by the way, is a Poe-esque tale of a woman who goes to a dinner on the occasion of her wedding anniversary and is greeted with a macabre scene laid out by her husband. (1) In that, Lamercie echoes the words of Lafcadio Hearn's Guiablesse, who tells a man who asks where she lives, "Zaffrai cabritt pa zaffrai lapin." The affairs of the goat are not the affairs of the rabbit. In other words, none of your business. (2) As we have seen, British author Hesketh Prichard went to Haiti a generation before Seabrook, and although he wrote about Voodoo and the Mamaloi, he seems not to have known about zombies. (3) I won't because I don't believe in cultural appropriation. People have been borrowing things from other people's culture for as long as there have been people. If you don't like cultural appropriation, you shouldn't put up a Christmas tree at your house next Yuletide season unless you're of German descent. And quit speaking English if you're not of Anglo-Saxon origin. A zombie? Maybe. A photograph presumably taken by William B. Seabrook in Haiti, circa 1928. From the El Paso Herald, March 31, 1928, p. 8. If you want to build a zombographical library, you might start with a hardbound collection from 1986 called Stories of the Walking Dead. 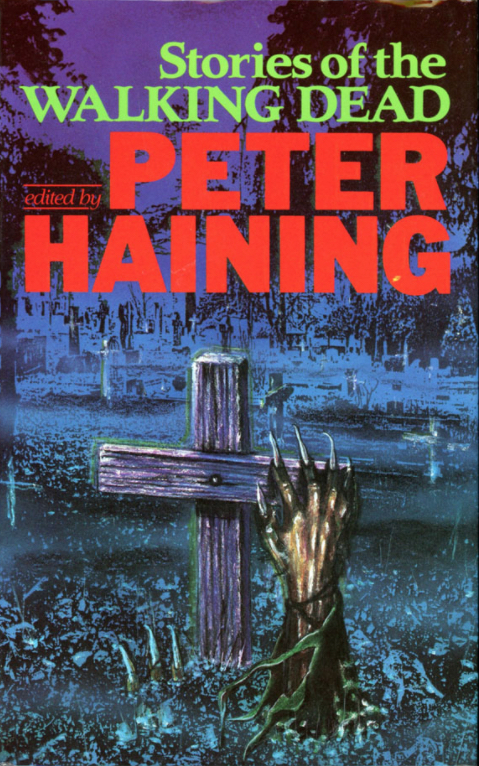 Edited by Peter Haining, it includes many seminal stories and articles on zombies. Almost all are of the Seabrook-type zombie, the version that has come down to us as one of the walking corporeal dead. (As you'll remember, the original zombi is a spirit.) First the contents, then, beginning in part two, the stories and their authors. Two of these stories first appeared in Weird Tales. "THERE'S no doubt about it," said the hardware drummer with the pock-pitted cheeks. He seemed glad that there was no doubt--smacked his lips over it and went on. "Obeah--that's black magic; and voodoo--that's snake-worship. The island is rotten with 'em--rotten with 'em." "But--human sacrifice!" he protested. "You spoke of human sacrifice." "And cannibalism. La chèvre sans comes--the goat without horns--that means an unblemished child less than three years old. It's frequently done. They string it up by its heels, cut its throat, and drink the blood. Then they eat it. Regular ceremony--the mamaloi officiates." Chittenden's story, Hesketh Prichard's original, Ewers' variations, and the general ideas of infanticide, human sacrifice, and cannibalism among practitioners of Voodoo might seem sensationalistic. Is there any truth in them? There is actually, as in the gruesome case of "the torso in the Thames" from 2001. In any event, Chittenden's protagonist, Reverend Arthur Simpson, is a Protestant and looks at the Roman Catholicism practiced in Haiti with distaste. The sacrifice of children by the Mamaloi and her coreligionists would seem to comport with his seeming anti-Catholic views. I searched for the words zombi and zombie in the text of "The Victim of His Vision." Once again, I didn't find any occurrence of either word. I also did a Google search for "Hanns Heinz Ewers" and "zombi" and came up empty. It looks like the stories, respectively, of zombies and of the Mamaloi, though perhaps from a common origin, diverged at some point, leaving only the inducing of a death-like sleep as a common element. Still no zombies before 1928. The song is about Jamaica. The group hails from California, I guess, but had, in the early 1970s, a Southern/Cajun/Texan kind of vibe. At least that's how I remember them. ("Mamaloi" is from the album Toulouse Street, named for a street in New Orleans. The album also has a song called "Snake Man.") (1) Anyway, if you keep searching, you'll find out that Mamaloi is a name given to a Voodoo sorceress, priestess, or queen. Her male counterpart is Papaloi. Among their powers are the ability "to produce a sleep which is death's twin brother." That's according to Hesketh Prichard in his book Where Black Rules White: A Journey Across and About Hayti (1900). The Mamaloi and Papaloi can also raise the afflicted person--usually a child--from this state of near death only so that he can be used in a human sacrifice. The raised dead of the Mamaloi sounds a lot like zombie-ism. It seems to me that following the Mamaloi lead might produce some results. But first, before I even started searching, I thought of the musical piece Ma mère l'Oye, or the Mother Goose Suite, by Maurice Ravel (1910). L'oye or l'oie is French for goose. I don't think that's the right track, though. It seems more likely that Mamaloi is a combination of Mama and loi or law. In other words, the Mamaloi is a person of some authority, power, or prestige. In searching for Mamaloi in literature, I found that, strangely enough, there is a connection to the German author Hanns Heinz Ewers (1871-1943), a fantasist and seeming decadent who lived a strange and interesting life. According to the book Decolonization in Germany: Weimar Narratives of Colonial Loss and Foreign Occupation by Jared Poley (Peter Lang, 2007), Ewers "was deeply fascinated by what he called the Mamaloi." (p. 99) Ewers wrote about the Mamaloi in at least six works, beginning with "Die Mamaloi," from 1907. The subject of "Die Mamaloi" is a Haitian woman, Adelaide, "who kills her son in a voodoo ritual." (p. 99) In that, Ewers seems certain to have read Where Black Rules White. According to Jared Poley, Ewers' fascination with the Mamaloi was because of her practice of infanticide. (2) Her use of Voodoo magic to afflict a person with near-death seems less the point, and Ewers' use of the word zombie or zombi is uncertain. I found the full text of "Die Mamaloi" in Spanish and searched it for zombie and zombi. No dice. So, again, a seeming miss in the use of those words before William B. Seabrook of 1928. I would add that Ewers is an interesting figure for students and fans of weird fiction. I would like to find a full-length biography and study of his works. I wonder, too, about discovering his works in English. (1) Notice in "Mamaloi" the phrase "island magic" with its echoes of The Magic Island by William B. Seabrook (1929). (2) As a moral transgression and an expression of self-loathing, infanticide is likely a sign of decadence in a culture or society. In fact, it would seem a key sign in diagnosing decadence, as it is demonstrates a lack of vigor, confidence, and hope in the individual and his or her society. Jared Poley ties it to "the Baal and Labartu creation myths from the fertile crescent." (p. 99) I am reminded of sacrifices made by Canaanites to Moloch and of the current worldwide practice of abortion, which--whatever its moral implications--is helping to bring about the dissolution of decadent societies. Cannibalism in the modern world, too, is a decadent practice: William Seabrook is supposed to have partaken of human flesh at least once. Aleister Crowley is also supposed to have been a cannibal. In 2001, Armin Meiwes, significantly a German, advertised for someone who would voluntarily be eaten by him. Bernd Jürgen Armando Brandes, significantly a German, answered the ad and ended up in pieces in Meiwes' refrigerator. In 2012, Floridian Rudy Eugene, of Haitian descent, tried to eat the face of a homeless man in Miami. For a time, some people were alarmed that Eugene's actions were the beginnings of a zombie outbreak. Instead, Eugene was probably using a synthetic drug, although his use of marijuana might be enough to explain his psychosis. That brings us to zombies, which are of course, cannibalistic and an ultimate expression of decadence, although wanting to be eaten by another person is probably even more ultimate. 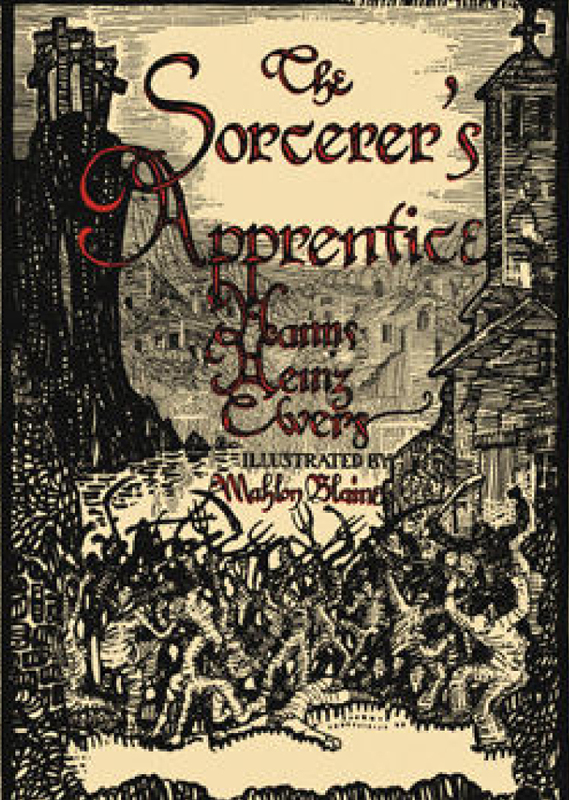 The Sorcerer's Apprentice by Hanns Heinz Ewers in an English edition of 1927, published by John Day, and illustrated by Mahlon Blaine (1894-1969). 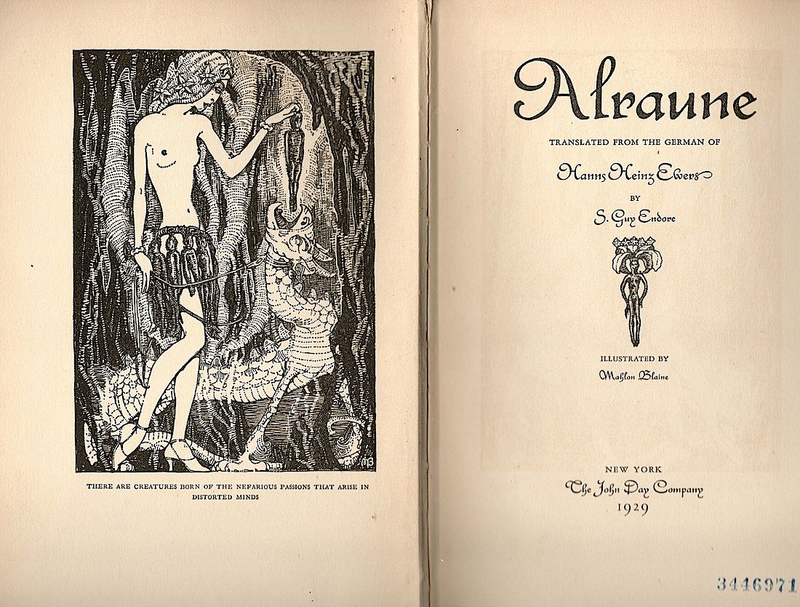 Alraune by Ewers, translated by S. Guy Endore (1900-1970) of The Werewolf of Paris (1933) fame. Published by John Day in 1929, this edition was also illustrated by Mahlon Blaine. Vampire, the last in Ewers' trilogy of Frank Braun, translated by Fritz Sallagar and published by John Day in 1934. Vampires are associated with zombies as among the undead, moreover, as among the cannibalistic undead. Blood, a collection of three stories from Heron Press (1930) and including "Mamaloi" from 1907. The pictures were by the children's book illustrator Edgar Parin d'Aulaire (1898-1986). 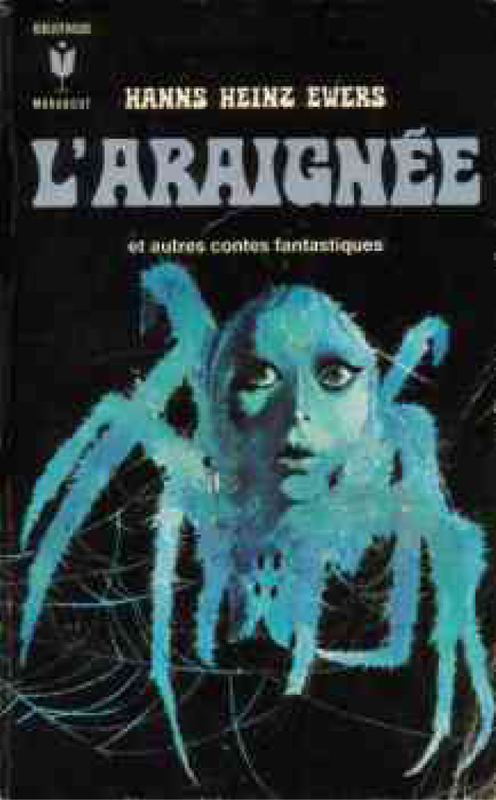 Although there are many, many more images I might include here on Hanns Heinz Ewers, I have decided to stop with this one, the cover for L'araignée et autres contes fantastiques, a French-language edition with an unknown date. "L'araignée" was originally "Die Spinne," from 1908. [The Mamaloi] can produce a sleep which is death's twin brother. For instance, a child marked for the Vaudoux sacrifice is given a certain drug, shivers and in some hours sinks into a stillness beyond the stillness of sleep. It is buried in due course, and later, by the orders of the Papalois, is dug up and brought to consciousness. There is another operation to which the Papalois--or more often the Mamalois--turn their power. They can produce a sleep which is death's twin brother. For instance, a child marked for the Vaudoux sacrifice is given a certain drug, shivers and in some hours sinks into a stillness beyond sleep. It is buried in due course, and later, by the orders of the Papalois, is dug up and brought to consciousness; of what occurs then I have written in another place. It is ghoulish and horrible, but beyond all question human sacrifice is offered up to a considerable extent in the Black Republic at the present time. The quote is from Where Black Rules White: A Journey Across and About Hayti by Hesketh Prichard, published in 1900 by Archibald Constable and Company of Westminster, United Kingdom, page 93. Hesketh Prichard (1876-1922) was Major Hesketh Vernon Prichard, an adventurer, military man, and author who is supposed to have created the first psychic detective or occult detective in literature. 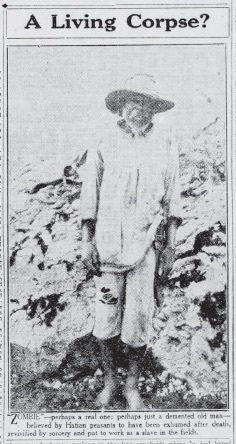 In 1899, he was sent to Haiti by Pearson's Magazine. According to Wikipedia: "No white man was believed to have crossed the island since 1803, and his trip provided the first written description of some of the secret practices of 'vaudoux' (voodoo)." Consciously or not, William B. Seabrook followed in Prichard's path in his trip to Haiti in 1928. I did a search for the words zombi and zombie in Where Black Rules White and came up empty. In his book, Prichard alluded to "what occurs" after the drugged child is exhumed and revived, events about which he wrote "in another place." Well, I did a search for the word sacrifice in Where Black Rules White, too, and didn't find anything certain. I'm not sure where that "other place" is. In any case, there are differences between Prichard's and Seabrook's accounts of zombie-making. Although a kind of sorcery is used in both, the purpose is different: In Prichard, the raised dead is used as a human sacrifice in a Vaudoux ritual. In Seabrook, the raised dead--explicitly called a zombie--is used as a slave-laborer. He is raised to go on living rather than to be sacrificed. I had hoped to find in Prichard the use of the word zombi or zombie, as I think the concept predates Seabrook, but the facts in the case of Hesketh Prichard are informative, for if no white person crossed Haiti in the period 1803 to 1899, then accounts of the zombie are unlikely to have made their way into white culture until at least 1900 when his book was published. And if didn't happen then, it would have had to wait until a subsequent account of life in the interior of Haiti was published. That leaves the period 1900 to 1928 as the only possibility unless: a) Zombies as the walking dead were elsewhere in Caribbean or black culture; or b) Zombies appeared in accounts written by black Haitians in the period 1803 to 1928. It doesn't look like zombies as the walking dead were anywhere else in Caribbean or black culture--remember Lafcadio Hearn's inquiries to Adou. 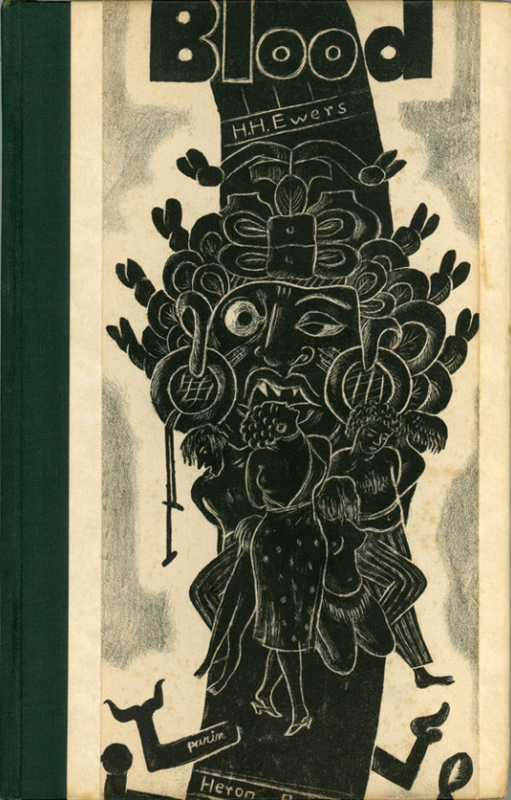 That leaves a question: Was there a Haitian literature before 1928 in which tales of the zombie could have appeared? 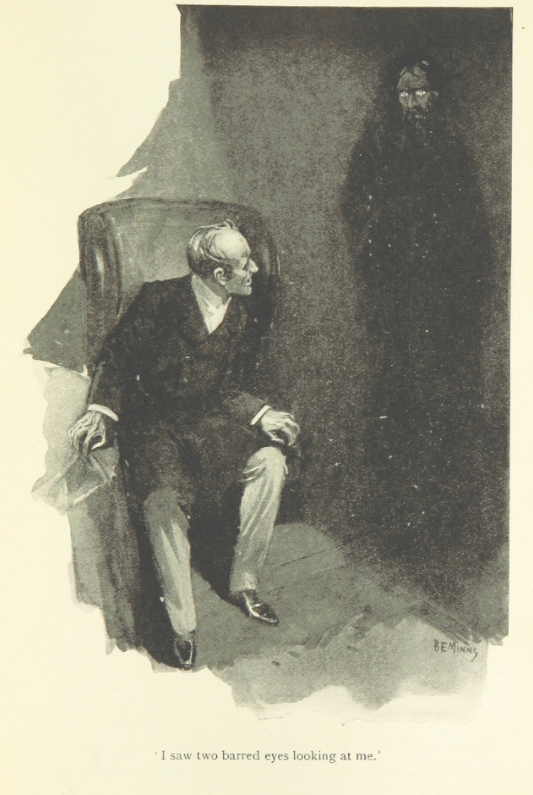 Two drawings for the series "True Ghost Stories" in Pearson's Magazine, 1898 to 1899, illustrating the Flaxman Low series by Hesketh Prichard and his mother, Kate Prichard. The pair used the pseudonyms E. & H. Heron. The artist was an Australian, Benjamin Edwin Minns (1863-1937). Thanks to John Linwood Grant of the blog Grey Dog Tales. So the scientific zombies of today are animated by and in thrall to a pathogen, a living thing that cannot be detected without the aid of instrumentation. What other unseen, undetectable, or unmeasurable forces might drive the behavior of a zombie or the conduct of a human being? Radioactivity might do it, as in the story of the Incredible Hulk. Parasites might do it, too, as in cattle infected with turning sickness. Genes are held to account by some people for much if not all of human conduct, or what they would call human behavior. Very often what is called "society" or "the system" catches the blame when things go wrong in the world. To that point, isn't "society" or "the system" also undetectable? If you think that it is, please point to "society." Draw a line around it and describe it. Try to measure its effects on the individual. What instruments will you use? What will be your units of measure? How will you test your hypotheses? How will you control for variables? Where is your control group? How will your procedure yield results that are either falsifiable or repeatable? Do you have answers yet? Have you found and measured "society" yet? The points are these: 1) All of these forces--pathogens, radioactivity, parasites, genes, and "society" or "the system"--are undetectable without instrumentation, or, as with "society," by instrumentation, and all are basically material, physical, or biological in nature. 2) All remove responsibility and accountability for the actions of the individual from the individual and place them on an outside and uncontrollable force. (1) 3) We have resorted to these forces because we're squeamish about naming others that might better explain human conduct. One I can think of is evil. "You're a zombie!" cries one side. "No, you're a zombie!" answers the other. And so it has gone since at least 2006 when the first overtly political scholarly paper on zombies that I know of was published. There is no logic. There are no facts. You can say blue, and they will hear white. One plus one equals cat. Calling the left mentally ill is truly a disservice to those who are mentally ill. At least with mental illness there’s a reason for the madness and a hope for a cure. There is no hope for the left. They are suffering from a deep-rooted spiritual sickness, one for which, I’m afraid, there is no cure. [. . .] The problem with spiritual disease is the fact that it can spread very quickly. Sadly, more and more are getting infected. In zombies, it seems, we have found a word and a symbol to mean whatever we want them to mean. They're the Swiss Army knife of monsters. They have become the F-word of ideas, i.e., the word that can be used as every part of speech and then some. Whatever intellectual, moral, scholarly, or creative problem you've got, zombies are the solution. If you go to the website of the Internet Speculative Fiction Database and do a title search for the word zombie, you will get back a list of short stories, poems, books, and magazines with titles containing that word. 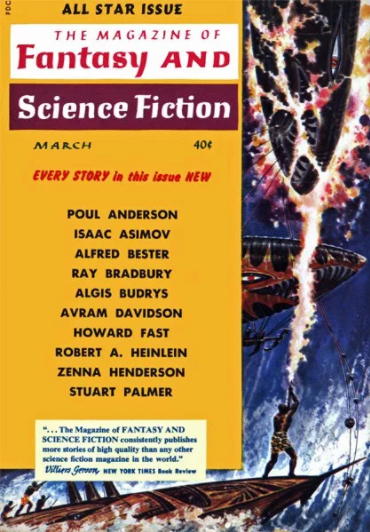 One of the most prominent and often reprinted is "All You Zombies--" by Robert A. Heinlein from The Magazine of Fantasy and Science Fiction, from March 1959. The story isn't what you might think: there are no zombies in it. It is instead a time-travel story and one of Heinlein's patented solipsisms. It may be, in fact, the most solipsistic and inverted story ever written. (I won't give anything away--you'll have to read it yourself.) But as with so many things, Heinlein was ahead of his time. He seems to have foreseen that we would all someday tend to look at everyone outside ourselves as mindless zombies, perhaps all of them as having meaningless and contemptible lives. The title is in quotation marks for a reason: it is a quote from the story and is directed by the protagonist at everyone. I have written a lot about zombies over the last several weeks and there is more to come. The irony is that I don't even like zombies very much, and the reason I don't like them is that they are everywhere. To me, they represent conformity and a lack of imagination on the part of the artist and writer. In my work, I strive to be original, imaginative, creative, and especially non-conforming. (I have to admit to being contrary, too. I am, after all, Irish.) I look for new things, new ideas, and new ways of thinking about, writing about, and depicting these things and ideas. Zombies aren't it (in general). Anyway, if you look at Tyll Zybura's zombibliography from a few days ago, you will see listed title after title and idea after idea that seem worn out and wrung dry. The idea of the zombie is a zombie itself: it's not just dead but past dead. It's a rapidly decaying mess, yet it won't lie down in its grave. It just keeps shambling on, especially in the minds of leftist academics. And though academics may be among the least imaginative of people (artists and writers are pretty bad, too) everyone seems to have uses for zombies, and everyone continues to rely on them. Zombies are used not only in art, literature, and film but also in journalism, political commentary, folklore, critical theory, philosophy, epidemiology, biology, robotics, and on and on. They have become all things to all people. One of the reasons I have written these series on zombies is to show that there is still the possibility of writing something original about them. (At least I hope I have written something original.) But there is so much that is not original, too, and none of it shows any signs of expiring anytime soon. So how much longer will zombies be with us? (1) Even genes are considered to be uncontrollable. There are, after all, phrases like "genetically programmed" and "hardwired" to describe human behavior that simply can't be changed because of its genetic origins. The language echoes that used to describe computers and robots. So do computers, robots, biologically programmed zombies, and genetically programmed humans exist all on a continuum or on the same curve, as in the second zombograph from the other day? Are they all simply variations of each other? (2) "Juden" refers to Mr. Friedman's point (and the source of his outrage) that the left has used--and trivialized--the Holocaust, its perpetrators, and its imagery to describe people who support our current president. The leftist's use of zombies is far more trivial, but it is put to the same use, namely, to malign those who oppose them or disagree with them.